One of the first colleges in the U.S. to offer a degree in UAS, K-State has become a leader in researching the technology and its potential applications. In addition to its research on the use of the technology in agriculture, disaster response and search and rescue, K-State is working to prepare for the safe integration of UAS into the National Airspace System. As a licensed pilot with years of experience Blanks coordinates the non-academic aspects of K-State’s program. Kansas State is doing cutting-edge research on UAS in agriculture. Can you tell us about what you are researching? What do you expect to learn? We have numerous different groups at K-State that are working with UAS in agricultural-related projects. However, the main thrust of the university’s research is focused on developing extremely low-cost aircraft systems that are capable of delivering accurate, timely information to the grower. There are numerous challenges in the real-world implementation of UAS for agriculture, especially on the sensor and data processing sides. It is very easy to deliver qualitative information about the crops and how relatively healthy they are across a particular field, but harder to produce quantitative data. The qualitative data provides information regarding the status of the farmer’s crops and areas that need specific attention, but doesn’t identify the cause of plant stress or provide a recommended corrective action. There are several projects ongoing at K-State to develop the ideal sensors and data processing techniques for agricultural UAS. We want to reach the point where we can provide high-confidence quantitative data to the grower that can be incorporated directly into their decision-making process or precision agriculture program. Determining the precise application rates of herbicides and fertilizers, estimating yields, and measuring fungus or insect infestations takes much more than a pretty aerial picture of the crops. In addition to developing new data processing techniques for agricultural imagery, we are also working on streamlining the processing so that the average crop consultant, grower, or other interested party could analyze the data intuitively and with minimal training. There aren’t many people that want to use five or six different expensive software programs to get to a single result. Instead, we would like to see this happen with a single piece of software. Another area of our research is in determining the economic impact of UAS on typical large commercial farms that dominate the Midwest. We are in the middle of a project that is comparing the accuracy of UAS remotely sensed data with traditional precision agricultural data products. We are hoping to prove that UAS can reduce input costs, increase yields, and/or decrease labor by an identified value that is validated with plenty of scientific data. I haven’t seen any research from the UAS community that shows the exact economic impact of UAS on precision agriculture, and we hope to produce that information by late 2013. Do you have any other upcoming research on UAS in agriculture planned? If so, what is it? We are going to continue working on our data, sensor, and economic research projects in the coming months and years. However, we are also considering other areas such as working with private industry to develop solutions for the agriculture market that move this technology from the research stage, which requires large amounts of focused expertise, to solutions that can be truly utilized by the industry on a daily basis. We are also looking at some future projects with applications to the livestock industry as well as conservation programs at both the state and federal levels. What are the most beneficial applications of UAS in agriculture? The most beneficial application depends primarily on the user group, since every user has their own needs. There are some who only want an aerial view of the fields to observe general patterns and others that really need precise data to enhance their precision agriculture practices. However, in general, I believe the most realistically useful application is early detection of crop stress, whether it is from drought, insects, fungus, over/under fertilization, etc. UAS can provide routine updates on crop health with a schedule that occurs often enough to catch a variety of these conditions earlier than through traditional crop scouting. This is partly because crop scouting usually occurs at random points in the field, while UAS can see the entire field and not be dependent on randomly catching the stressed areas. What are some ways in which UAS could help in agriculture that aren’t yet available? Everyone continues to talk about the potential for aerial application (crop dusting) using UAS, but we are nowhere near currently being able to do this on a large scale. The Yamaha R-Max and work that is ongoing in Japan is great, but for the large-row crop operations throughout the U.S. the aircraft are going to have to be much larger in order to carry more payload and fly much larger pre-programmed patterns. The technology to make this happen certainly exists, but the regulatory environment and community acceptance of large-scale UAS aerial applicators is probably many years off. As for other ways in which UAS could help in agriculture, I think the only thing that limits their usefulness is how much we can let our imagination roam. Someday I hope to see UAS that could interact with objects in their environment, such as identifying crop stress and maneuvering to take a tissue sample of the suspected plant, or perhaps even be able to herd cattle. Additionally, interoperable ground robots and UAS could do some really interesting things with agriculture, which may be in the near future for our research. What applications for UAS outside of agriculture are you researching at Kansas State? We are focused on three primary applications for UAS: agriculture, public safety, and the energy sector. Agriculture is certainly one of our strongest areas of research, but we have been actively engaged in developing practices for UAS in disaster response and search and rescue operations for several years. Additionally, we have been researching the use of UAS in applications to the energy sector ranging from inspection of wind turbines and pipelines to offshore oil platform security. K-State is also researching what I like to call “enabling topics” that will help expedite the integration of UAS into the commercial markets. Particularly, we are working on a couple of projects relating to airworthiness certification of small UAS. We have some faculty that are doing great work in flight path planning and 4-D trajectories, as well as the always-popular sense and avoid topic. However, I believe that limited commercial operations could happen sooner rather than later if we can solve some of the challenges of airworthiness certification, so we are pushing hard in this area. You are one of the pioneers of UAS education. How have you seen the field change since you began working in it? There are many people that came before me in the field of UAS education, so “pioneer” may be a bit of a stretch. However, there is no doubt that the education of UAS professionals is evolving rapidly. We originally saw most of the demand for graduates with skills that were focused on the military applications of UAS, such as the ability to operate for long periods of time in austere environments. However, we are now seeing more demand for multi-talented graduates to perform a wide variety of civilian jobs in the lower 48 states. We are currently considering ways to evolve our curriculum to address the unique skills that applications such as agriculture and aerial surveying require. Particularly, we are seeing a need for operators to be able to not only fly the aircraft, but also process the data that is collected and interpret the results. There are also some training/expertise gaps that higher education has not addressed that are becoming apparent in the UAS industry. I am sure we will continue to see the evolution of this rapidly changing field, but the best practices are beginning to emerge and the technology is rapidly evolving making UAS more affordable and easier to operate. What skills does the Kansas State degree in UAS focus on? What do your students go on to do after they graduate? Our current degree program is a Bachelor of Science in Aeronautical Technology with a UAS Option, which is an air vehicle operator-focused curriculum. Our students learn how to operate numerous different autopilot systems and they get a diverse background in engineering technology, manned aviation, and aircraft/avionics maintenance. During their senior project, our UAS students complete a capstone project that is customized to the skills of the student and their desired future career. Typically our students will design, build, and fly a small UAS as part of their senior project and may also integrate different payloads. The majority of our current students have historically gone to defense contractors, but we are seeing a shift towards more civilian-related jobs such as safety, training, and U.S.-based operations. What draws your students to study UAS technology? 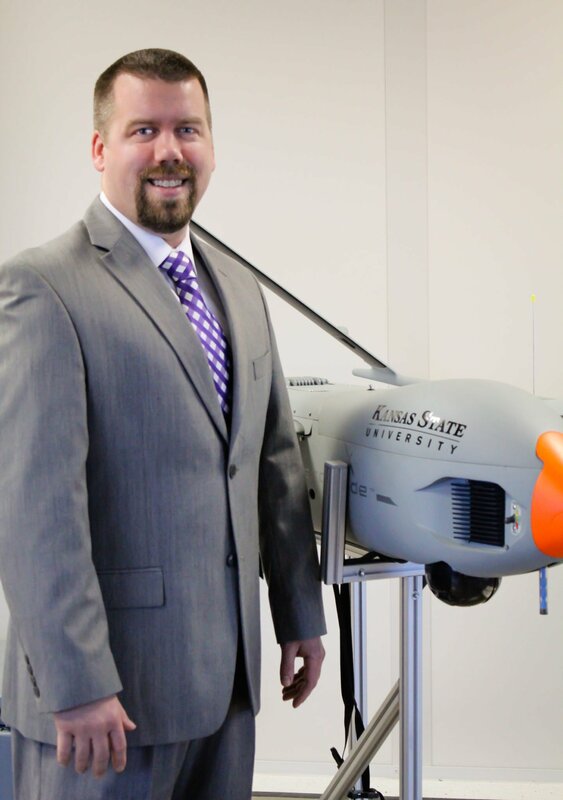 Most of our students realize that unmanned systems are where the aviation market is going in the future, which is a primary reason that they choose to study UAS at K-State. Some of them are accomplished RC pilots with years of modeling experience, some are proficient manned aviators, and others have never flown any type of plane, manned or RC. Additionally, some of our students are ex-military UAS operators looking to put their military experience to use in the civilian market. The thing that they all seem to have in common is an excitement for the future of UAS and potential careers in this market. Many of our students are drawn to K-State in particular because of the unique opportunity we offer them to perform much of their training during live flights in restricted airspace. Having the opportunity to get hands-on experience sets K-State apart from many other institutions and adds another level of learning that cannot be completely replicated in a simulation environment. What originally got you interested in the field of UAS research? After working primarily in manned aviation maintenance, certification, and flight testing, I found UAS to be exciting because there is so much work that needs to be done to integrate them safely into the National Airspace System. I liked the dynamic, evolving environment that comes with leading edge technology that is still being proven and I also thought it would be a challenging career. I believe that my diverse manned aviation background is very helpful in understanding the “big picture” to UAS integration, as well as identifying challenges in new applications of unmanned systems. One thing is sure, this industry is changing every week and there is never time to get bored with it.